The weather report for the weekend is looking pretty good. Sunshine and mild temperatures on Saturday and Sunday are sure to complement the events and activities happening around Hendricks County. We all know how much I love Beasley&apos;s Orchard and with their market now open for the season, it&apos;s a good time to stop in, see why and beat the rush. Fresh produce, including peaches and garden tomatoes, a variety of sweet treats and everything in between can be found in the market. The first pick of their Lodi apples also should be in the market soon. Delicious. 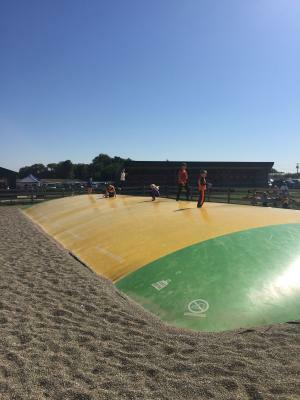 Barnyard Bonanza offers fun for the whole family, and Beasley&apos;s is offering the sweet summer rate of $3 per person. Older kids and adults will enjoy the sports area that includes football throw and basketball hoop shot games. Younger kiddos can climb, dig and bounce until their little heart&apos;s content -- or they tire out, whichever comes first. The market and Barnyard Bonanza are now open from 9 a.m.-7 p.m.Tuesday-Saturday and noon-7 p.m. on Sunday. This summer event has become quite the attraction. All the yummy-ness of the Rib-Fest, coupled with the beauty of the Balloon Glow makes for a super event. My family attended last year, and we had a blast. It was quite warm last year, but we didn&apos;t mind it one bit. We were pleased to find a variety of awesome food vendors in addition to the best ribs and barbecue around. We ended up getting a little bit of everything. It was delicious. With full bellies, we found a shaded patch to park our blanket and enjoy the giant air balloons. I don&apos;t think these giant beauties will ever lose their luster. Read the awesome preview my fellow blogger, Crystal, wrote recently here. Get the grub and take in the sights beginning at 4 p.m. The event concludes with the popular balloon glow and fireworks at 10:30 p.m. on Saturday at Kingsway Christian Church, 7981 E County Road 100 North, Avon. Admission is free, but parking is $5. Park Naturalists at McCloud Nature Park, 8518 N. Hughes Road, North Salem, will offer yet another awesome summer event from 9-11 p.m. this Saturday. Experience a late night hike while chasing and learning about those magical lightening bugs that fill our Hoosier summer skies. Growing up in California, fireflies have always fascinated me, and I love to watch my children chase them. The cost is just $5 per person and includes a glow stick and an insect jar. You can&apos;t beat simple summer fun that provides lasting memories. Although I am not familiar with this event, it sounds really cool. 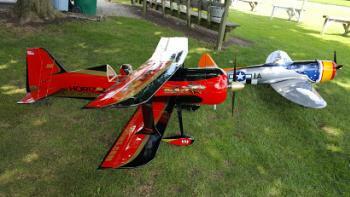 Blacksheep R/C Modelers Club of Danville will host their 10th Annual Fly In on Saturday from 10 a.m.-4 p.m. at the Corsair Field, 178 E. Twin Bridges Road, Danville. This free event will feature radio-controlled warbirds of all sizes and types including WWI and WWII models to modern day jets. These unique models will be on display and overhead, providing an awesome airshow. A concession stand and raffles will also be available. My idea of a perfect summer Sunday includes enjoying a slow lunch outside. Whether it&apos;s a picnic at any of the top-notch parks we have in Hendricks County or taking advantage of the outdoor seating available at our many restaurants. My family favors The Oasis Diner outdoor seating for a late lunch during the summer, but there are many other outdoor options in Hendricks County. A slow Sunday sounds like a great way to finish out this fun-filled weekend in Hendricks County.